Welcome! I am Chrysa Gkizari and Nourishing Foods Oslo is the result of my own journey in restoring my health through dietary changes and my love for creating homemade food. In 2015 I faced severe digestive issues that resulted in losing 15 kg in less than two months. I was so weak that I could not even get out of the house alone. I had numerous visits to doctors and tried different medications. The medications somewhat helped in the first months, but still I was in pain and unable to gain any weight. I was afraid that this would become a lifelong condition but at the same time I refused to see myself in pain and on medication for the rest of my life. I started exploring different ways to heal myself. This was a long journey that ultimately made me rethink the healing power of food. It was a journey on regaining balance between body and mind. I was lucky to find Vivi Ann Øvergaard (Ernæringsterapeut og akupunktør), an amazing nutritionist in Oslo who helped me through this journey. We removed gluten, dairy, refined sugar, and processed foods from my diet. Soon after, I started feeling stronger and healthier. I was becoming myself again. This was not an easy process and challenged me in many ways. I could not eat raw food and it was very difficult to find baked goods without gluten, dairy, nuts, refined sugar, and yeast. That was when I made a promise to myself that when I got better, I would help others facing similar problems. With the help of my nutritionist I began to understand the healing power of food and how every cell in our body needs unprocessed, real food in order to function properly. As they say, ‘we are what we eat’. Putting my education as an academic researcher in practice, I began to study further in order to gain a deep understanding of the connection between what we eat and our physical, emotional, and social well-being. After restoring my health I decided to follow my passion and so Nourishing Foods Oslo was created with the help of Lampros Lamprinakis, my supporting life partner. 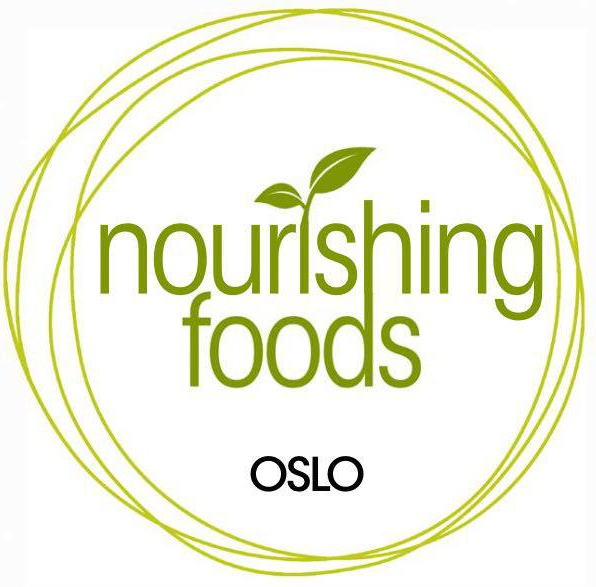 Nourishing Foods Oslo is more than a food company. It is a way to share both my love for nourishing food and what I have learnt throughout my health journey. We create organic, hand-made baked goods, snacks and raw treats that are made 100% without gluten, dairy, soya, refined-sugar and artificial ingredients. We use local ingredients as much as possible! We also create vegan and nut-free goodies! We would love to make customized orders for you! Ours goods are delicious and nourishing for body and soul. We will be very happy to hear from you!